This past July 1st the curtain was raised on the 380-room Ramada Plaza, the first Ramada hotel to be built in Korea. 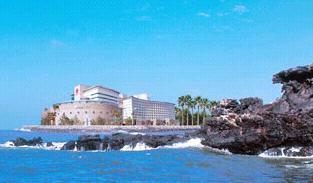 Only an hour's flight from Seoul, the hotel is located on beautiful Jeju Island. Ramada International, an affiliate of Marriott International, runs 175 hotels in 20 countries around the world. This new hotel ranks in the top-tier of the Ramada International brand. Nestled on the beautiful beach of Yongduam, The Ramada Plaza Jeju Hotel offers the usual luxury combined with the relaxing comforts of home. The hotel is especially proud of its first-class resort facilities and panoramic views of the sparkling Pacific Ocean. Guests can even enjoy the view while soaking in a hot tub. And the Kids Suites offer separate playing rooms for children. Situated on reclaimed waterfront the hotel is a mere five minutes by car from Jeju International Airport and Jeju Harbor. The hotel is uniquely shaped to resemble the Northern European cruiser "Silia Line”which gives patrons the added feel of being on a luxury liner. A youth-themed pedestrian walkway runs directly in front of the hotel, where visitors can enjoy live performances and buskers on the beach. A conveniently located boardwalk allows guests to walk right down to the ocean. The hotel also hopes to attract business clients and to that end built a state-of-the- art conference center, which is now the largest and most advanced on the island. The hotel also has a Business Center with all the usual amenities such as video-conferencing and internet access. The sports center is also a source of pride. It boasts an indoor pool, with a capacity of 395, a sea-view outdoor pool and a fitness club. Jeju Plaza offers a wide choice of culinary delights. Guests can choose from six different restaurants, which range from spicy Korean and East Asian dishes to tastes more suited to a Western palate. A coffee shop is also available for relaxing and casual meetings. 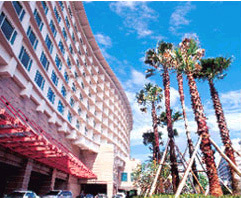 For more details and reservations please visit Ramada Plaza Jeju Hotel(http://www.ramadajeju.co.kr).